Federal elections were held in Germany on 31 July 1932, following the premature dissolution of the Reichstag. They saw great gains by the Nazi Party, which for the first time became the largest party in parliament, though without winning a majority. With the Communists remaining strong, anti-republican parties together now had a majority in the Reichstag (called a "negative majority" by contemporary observers since the two parties would never have allied), making a (majority) government by any union of pro-republican parties impossible. Since 1929, Germany had been suffering from the Great Depression as unemployment rose from 8.5% to nearly 30% between 1929 and 1932, while industrial production inside Germany dropped roughly 42%. In 1930, the governing grand coalition of the pro-republican parties – Social Democrats, Centre Party and the two liberal parties – had broken apart. President Hindenburg had then appointed a minority government headed by the Centre Party's Heinrich Brüning which could only govern via President Hindenburg's emergency powers. Shortly afterwards, in the elections of 1930, the democratic parties lost their majority in the Reichstag, making any parliamentary government impossible. These elections also saw Hitler's Nazi Party rise to national prominence, it became the largest party for the first time. Brüning's policies, implemented via presidential decree and tolerated by parliament, failed to solve the economic crisis while weakening the parliamentary system. In March 1932, presidential elections pitted the incumbent Field Marshal Hindenburg, supported by pro-republican parties, against Hitler and the Communist candidate Ernst Thälmann. Hitler gained roughly a third of the vote and was thus defeated in the second round in April by Hindenburg, who gained a narrow majority. However, after this victory Hindenburg increasingly moved towards the political right and at the end of May 1932 was persuaded to dismiss Brüning as Chancellor, replacing him with Franz von Papen (a renegade of the Centre Party) and a non-partisan "Cabinet of Barons". Papen's cabinet had almost no support in parliament and only three days after his appointment, when faced with this opposition, had the President dissolve the Reichstag and called for new elections, to be held on 31 July, so that the Reichstag could not dismiss him immediately. 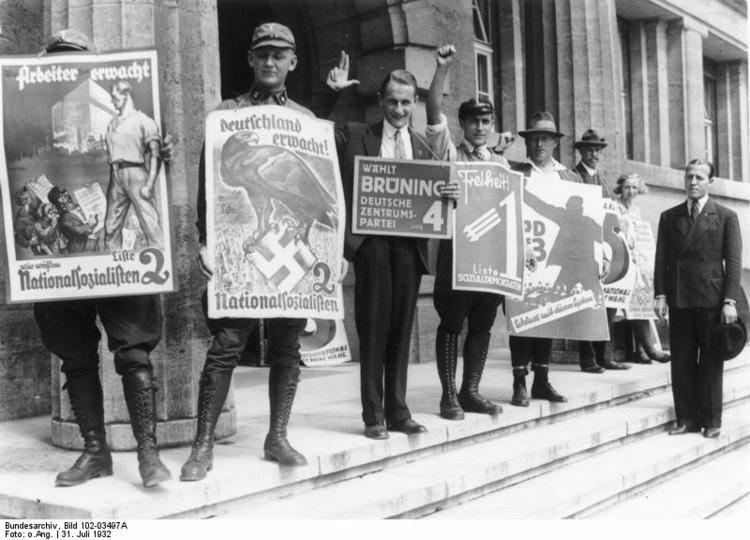 The election campaign took place under violent circumstances, as Papen lifted the token ban on the SA, the Nazi paramilitary, which Brüning had banned during the last days of his administration. This inevitably led to clashes with the Communist paramilitary. Note: The SA openly carried unsharpened Holbein style parade daggers to maintain compliance with an existing weapon law, while simultaneously using the appearance of an armed force for intimidation. The main purpose of such a strategy was to use Police manpower as a tool, by diverting their attention toward other partisans who armed themselves with functional weapons in response to the ploy, partly disrupting competitors efforts. The elections resulted in great gains by the Nazi party, who with 230 seats for the first time became the largest party in parliament. Neither the Nazi Party nor President Hindenburg had a governing majority and the other parties refused cooperation. Neither side had a majority on its own and no coalition could be formed to create a governing majority. Hence, Papen's minority government continued, leading to another election in November.